Is it CBD oil? It’s Green Roads World hemp oil with added CBD. Sourced in the United States? No. Certified Organic in the US? No. Green Roads CBD oil reviews can be hard to come by online. We have produced here the most comprehensive review of the health benefits and risks of Green Roads cbd oil 350 mg. This product can be used as a supplement for non-medical anxiety, depression, pain and other discomforts. It is not a medication for treating medical conditions. Green Roads CBD Oil is to be used as a supplement for the relief of many discomforts and the improvement of quality of life. Using a natural supplement for non-medical discomforts has the advantage that one is using a plant which has evolved in symbiosis with animals and thus has evolved compounds to affect the animals’ behavior in a targeted way, reducing side effects. Also, the many other compounds in the plant produce an entourage effect where the ingredients boost and support one another. 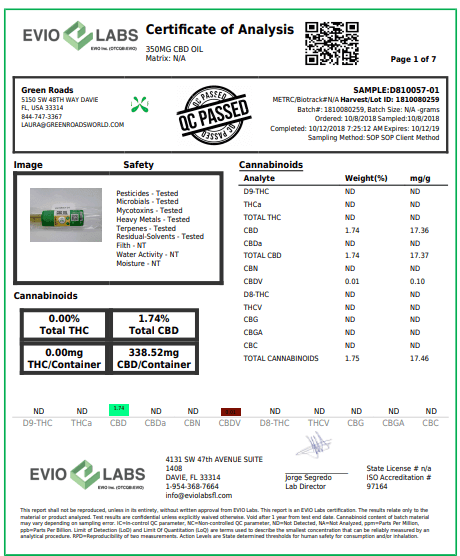 Green Roads CBD Oil and tincture is 3rd party tested and the results of testing is posted on their website for each product. Testing for Green Roads CBD oil 350 mg shows 338.52 mg of CBD and the correct levels of every other substance tested for. This suggests that the product should be effective in soothing discomforts which studies suggest cannabidiol may be effective for, including symptoms of anxiety and pain. We are focusing on Green Roads highest quality CBD oil; however, Green Roads has a large variety of CBD products. Green Roads CBD oil was first created as a 350 mg cannabidiol oil around 2013. Each dropper measures one ML and contains 23 mg of CBD which is widely considered equivalent to one dose. Cannabidiol is a cannabinoid which has been widely studied. It produces effects by binding to several receptors in the central nervous system. Cannabidiol first gained popularity as a component of medical marijuana. Medical marijuana was first shown to reduce seizures in children in a news exclusive about parents who put their young daughter on medical marijuana. It was subsequently shown to treat Parkinson’s and various other illnesses. However, the psychoactive effect and high was unwelcome by some. It was then that it was noticed that a different cannabinoid in cannabis sativa, cannabidiol also produced effects, including the ability to reduce seizures in children. This makes it possible to get the positive effects of medical marijuana without the high. Another important aspect of cannabidiol is that unlike THC, it is not illegal. However, the cannabis Sativa and Indica plants are themselves illegal. Yet, there are different laws for industrial hemp. Therefore, manufacturers started sourcing their cannabidiol from industrial hemp which contains very little THC (less than 0.3%). Green Roads World gets their industrial hemp from Europe where the quality is strictly controlled. However, many people prefer to use products from only American grown industrial hemp. In any case, they are able to produce high quality cannabidiol legally and infuse it into their products. Cannabidiol comes from the cannabis sativa, indica, and ruderalis plants. It is the second most abundant and second must studied cannabinoid, behind THC. Unlike THC, cannabidiol does not produce a high. Industrial hemp is likely to be a cannabis ruderalis plant which produces only low levels of THC. Green Roads CBD oil also contains certified organic hemp seed oil. Industrial hemp seeds are known to contain beneficial fats, terpenes, and low levels of cannabinoids. It is a good source of balanced omega 3 and 6 fatty acids and has been used to reduce skin inflammation and other discomforts. 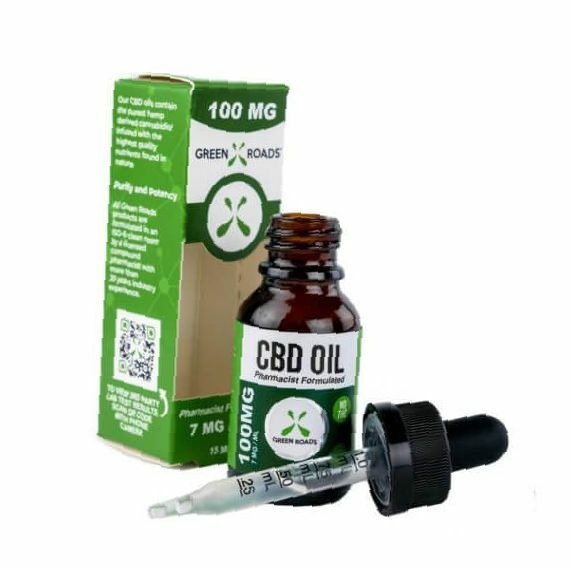 This oil is then enriched with CBD isolate extracted from the hemp plant and concentrated such that you get cbd hemp oil drops. The chart below purportedly from Mayo Clinic tells you how the active ingredient cannabidiol is dosed when it is used as a medication for illnesses. Our review is for non-prescription cbd oil, used for non-medical discomforts but you can use this chart to estimate an effective dose for what your issue may be. You can also just start with one dropper full of the 350 mg bottle, equaling one milliliter which is a 23 mg delivery of CBD. When ready to titrate up, perhaps add a few more drops or a half of a dropper and continue to titrate up until you get to a dose which is effective for you. It is difficult or impossible to overdose on cbd, though ineffective doses can give you unwanted symptoms like dry eyes and dry mouth. Green Roads World clearly lists the volume, total CBD, dose per serving and recommended use under the tongue. This is a very good sign that the product may be legit. Illegitimate products try to confuse consumers about how much CBD is contained in a serving in order to pass off hemp seed oil content as if it were CBD content. 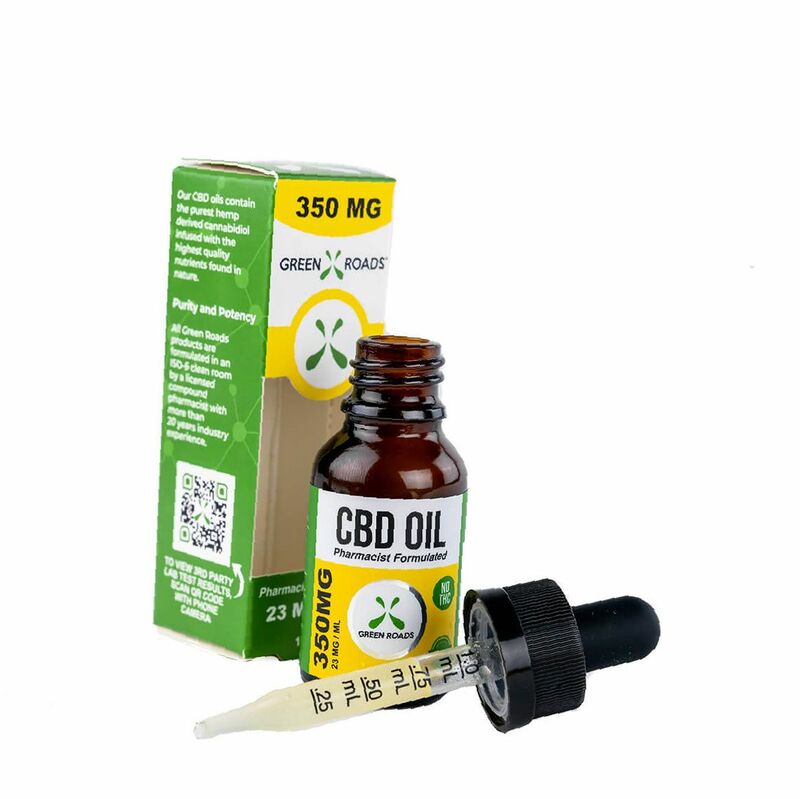 One product for example has only 33 mg of hemp extract per dropper but lists this on the front of the bottle as 33 mg of CBD hemp per dropper, confusing the customer and covering themselves in case the FDA or another lab busts them. Green Roads World instead lists the ingredients and amounts clearly so that you can dose appropriately with the dose of cannabidiol you need. Manufacturer: Green Roads World. Green Roads World is a manufacturer and distributor of CBD products derived from industrial hemp. Their products are in over 5000 stores and reach a million online customers. Their mission is to gear the treatment of non-medical discomforts to more natural substances with fewer side effects. You can see from this analysis, Green Roads World CBD 350 mg oil has CBD levels measured at 333.52 mg per container. This is a dose which is high enough to produce therapeutic relief from various discomforts. Green Roads Word CBD has all kinds of products from oil to full-spectrum Green Roads cbd terpenes and edibles and therefore many different ways to take therapeutic cbd. A big positive is that they clearly label their products and tell you how much cbd is contained in them. There is little attempt to obscure the contents or confused you about the difference between cbd oil and hemp oil like some companies. Green Roads World claims that its products are formulated by a pharmacist and this may add another layer of credibility although the products don’t seem to have been produced any differently than comparable products which do not make the same claim. One negative of Green Roads Word products is that they don’t have THC, so they don’t have the full-range of benefits one might receive from medical marijuana. Also, since it is sold as a supplement not regulated by the FDA, these products are not held to the same standards as the prescription form of cbd called Epidiolex. However, the only thing stopping companies from producing pharmaceutical-grade cbd would be their own manufacturing processes and Green Roads World at least claims its products are formulated by a pharmacist, suggesting that it is pharmaceutical-grade, same as you would get from prescription cbd. CBD itself has a very benign side-effect profile and no known overdose fatalities. FDA has found a lot of off-brand CBD products do not contain the stated level of CBD, and some contain amounts of THC which are not indicated on the label which could be illegal or cause a failed urinalysis. This mother said that Green Roads World cbd oil made a difference with her child but decided to switch to another brand due to the gummies containing red coloring called Red40 which many parents greatly dislike and blame for health problems in children. This customer is greatly satisfied with Green Roads CBD Oil and puts it simply and unambiguously. 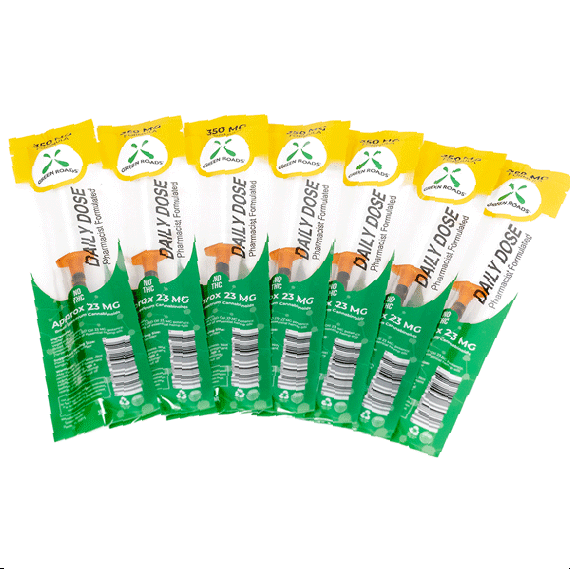 This user is very satisfied with the quality and the taste of Green Roads World products. This reddit user claims labs show contaminants in Green Roads World products. This claim does not fully stand up to scrutiny but that’s why it’s great to have the labs available on their website such that if you have any concerns, you can check the labs yourself. Is Green Roads a scam? No. Our research suggests that Green Roads World is legit. Start with up to 25 mg and titrate up as needed. Do not exceed 300 mg without a doctor’s advice. No. Hemp oil is made from hemp seeds and does not contain therapeutic levels of CBD. The oil has its own health benefits separate from CBD. 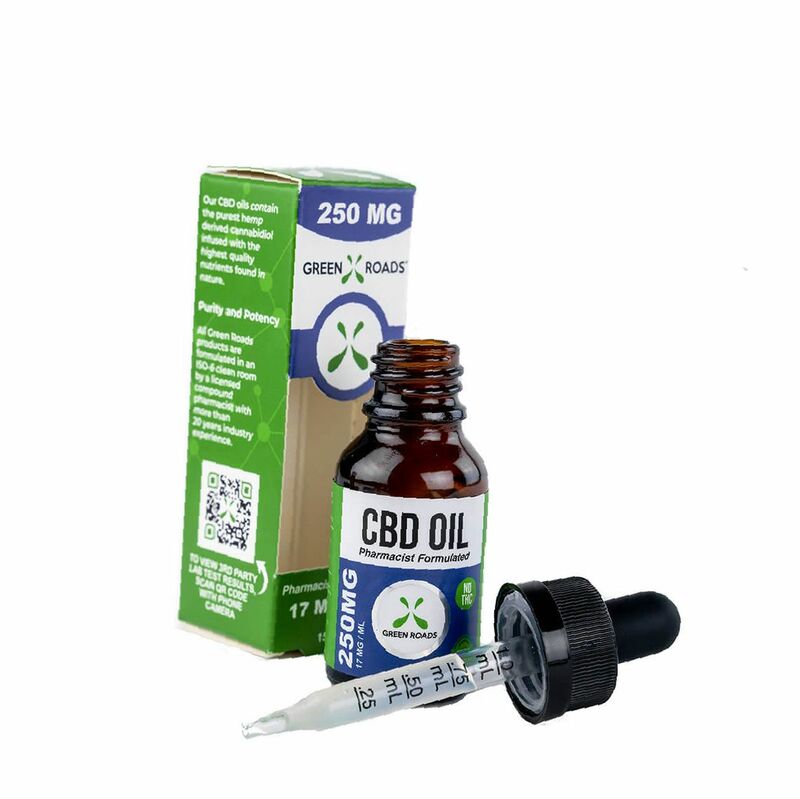 Green Roads World CBD oil contains cbd hemp oil drops, which is hemp oil infused with CBD. Does CBD oil contain metals and toxins? Green Roads tests all of its products for metals, pesticides, and toxins and places the results online showing its products are clean. Would we buy this product? Yes! Green Roads World is the most transparent company we have reviewed as of yet. They have been featured in such popular media as Forbes, NBC, and High Times. They clearly list the content of CBD in their products by dropper, by gram, and by percentage. They are not trying to hide their cbd amounts or their manufacturing processes. One of the biggest scams committed in the cbd selling world is to list only a milligram amount of hemp oil and pass it off as cbd oil when it contains very little cbd. Green Roads World tells you exactly how much cbd you have, and they are therapeutic levels. Also, the lab reports they submit are easy to read and straight forward. 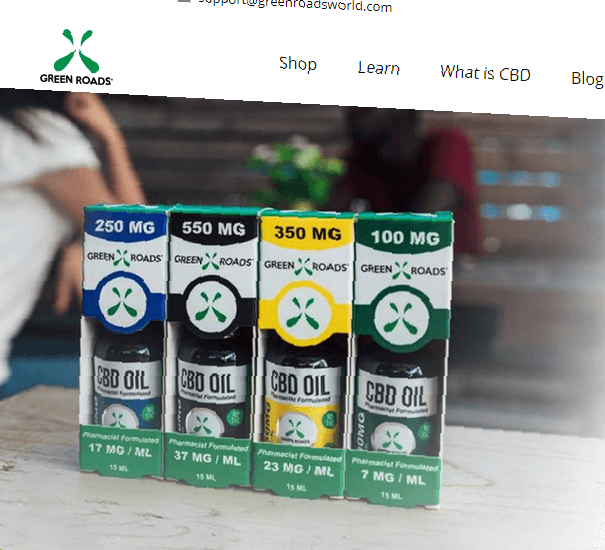 If one is going to try a cbd product, Green Roads World seems to be a sure bet. 7 Does CBD have any side effects?